In lieu of a better way of doing it, here is a photo of the barcode and other details of the models I used for my Frost Giants. Good luck hunting them down for conversion or litigation purposes! 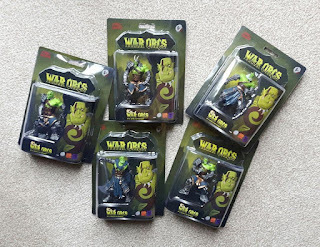 I'm a big fan of toys for fantasy gaming; snobs and purists be damned, the point of fantasy gaming is it can be what you want. Gamers who refuse to play against unofficial models can get lost frankly. Sure, I'm not going to use wildly unhistorical miniatures in my fact based forces, but these are never going to be on a table facing Austrian Hussars, US Marines or Roman Legionaries, so none of those concerns apply. Point being, when I spotted a range of toys in one of the local bargain shops, I was struck with inspiration. 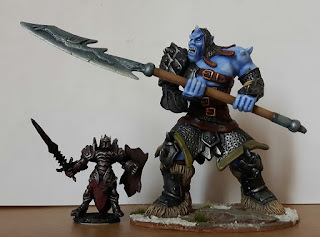 The models looked nicely detailed - well enough to make one presume, correctly, they were copied from/inspired by something else - but pretty averagely painted. 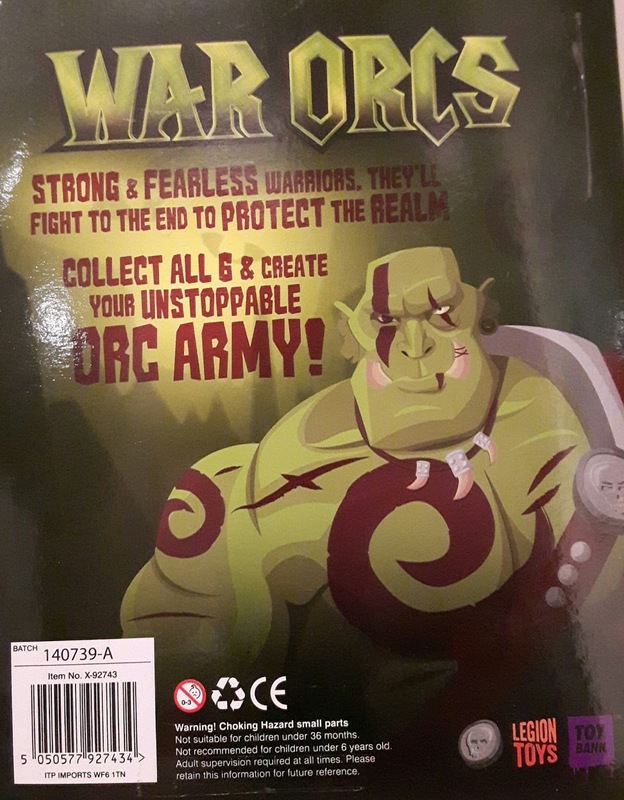 Branded as 'Orcs' they could fulfill only one role in my mind, given their size. Giants. There was a fair amount of work to tidy up the models, cleaning the worst mould lines and filling gaps. As a first stage I based the models on MDF to make it easier to work on them; each model was taken apart and reassembled with superglue. 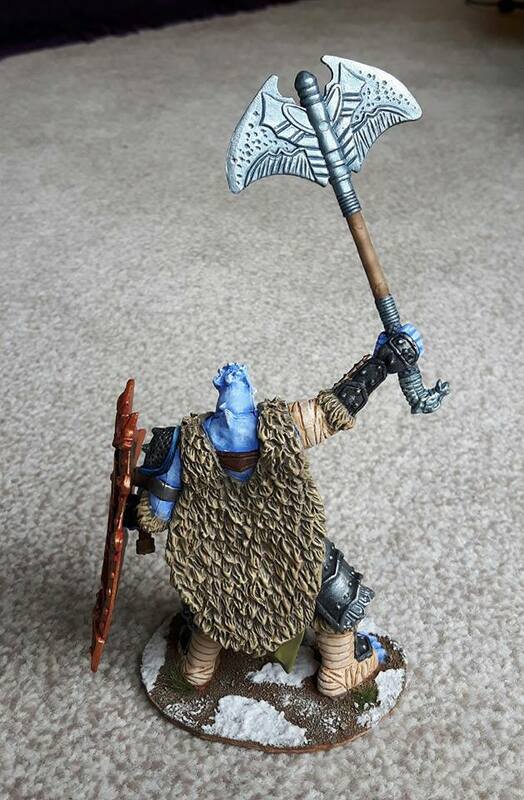 A little light conversion was undertaken and an extra weapon was knocked up from the bits box. Finally the figures were given a good coat of spray undercoat. Now in the past I have had issues with undercoat on soft plastics, and I thought I would again here. The models were initially tacky to the touch. But I put them to one side whilst other projects were completed. A week of monitoring the models revealed the tackiness gradually disappearing, until after about six days it had gone entirely. So I can conclude the problem in the past has been haste; the oils/chemicals in spray primer takes maybe a week to cure out of the paint, but perhaps painting over it with other paint seals it in and keeps the sticky effect more or less permanently. Patience is a virtue! 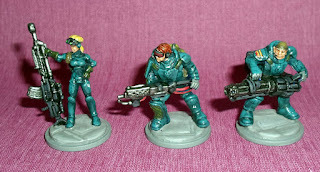 Painting commenced and other than working on much larger models than normal, it was all very simple. 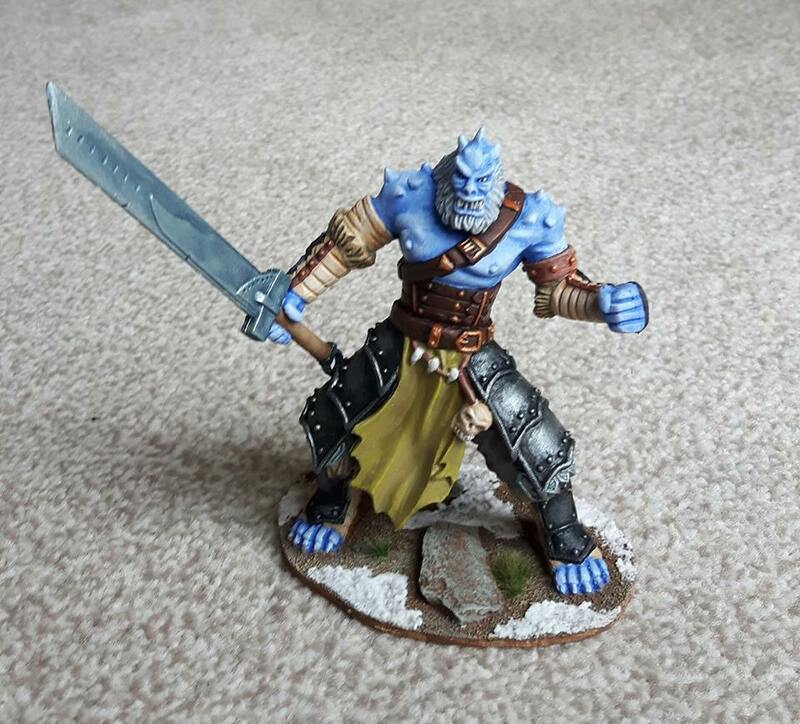 Given the scale of the models I went for five layers of progressive highlights on the flesh and some of the other big areas of detail. It took a while, but not too long, about the same as a normal unit of 20-24 figures. 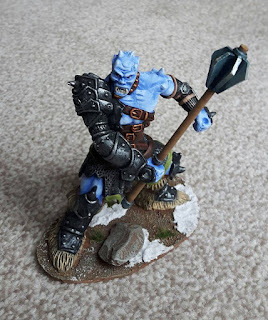 I was particularly pleased with the flesh tones, and decided on a generally muted palette for the rest of the figures, so as not to detract from the impact. A look of cold was carried through into the bases, relying on the old Bicarbonate of Soda trick. Yes it might yellow with time, but if push comes to shove I can always paint over it! 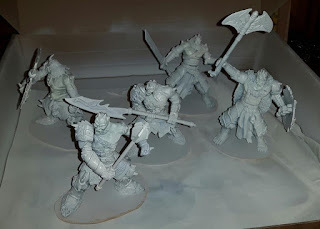 Thus, these five models make for a complete 24 point Dragon Rampant army, on the basis of Reduced figure units; Alternately, they could reflect an allied contingent of giants in Kings of War, perhaps worth a 1,000 points. Either way, at a total sum of £5, I can't really complain. 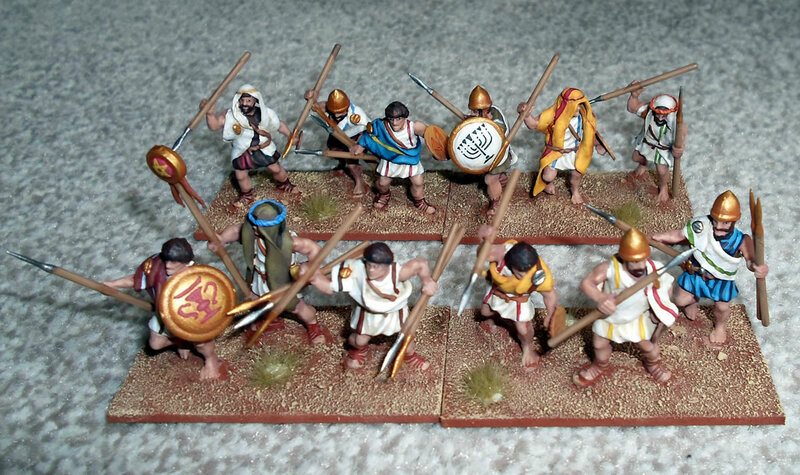 Well, having not painted any for the best part of four and a half years, I finally got back to the Jewish Project and thoroughly enjoyed turning out a couple more units. These models are an improved mix of poses and equipment, thanks to the introduction of some Victrix Carthaginian spearmen. More particularly, their set is a supply for a good number of oval shields and different helmets. Realising that human and animal designs were prohibited in the Jewish faith at this time, I've limited the shields to plant life and inanimate designs, so more accurate I think than the last unit I did. The Mantles are much better here, with a more natural flow; thanks to the use of olive oil and a plastic rolling board to allow me to get the Greenstuff extra thin. Next I did a unit of lighter guerrilla's, made only from the Wargames Factory Numidians. At this point I would note I'm glad I bulk bought a 150 or so of these guys five years ago, as to date their new owner, Warlord Games, has not chosen to re-release them. 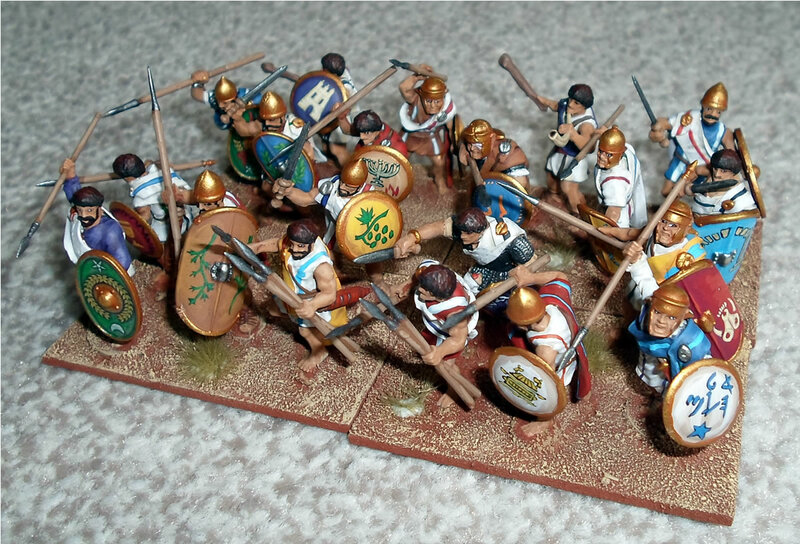 These chaps use mostly the javelin arms, with only a couple of large shields, and a bunch of hide covered, wicker shields, I made simply from some etched plasticard. I tried the classic Arabic head cover, using the mantle, on several models for some variety. These chaps would not lead the fighting line, but favour skirmishing, though they can support the mainline from the rear. 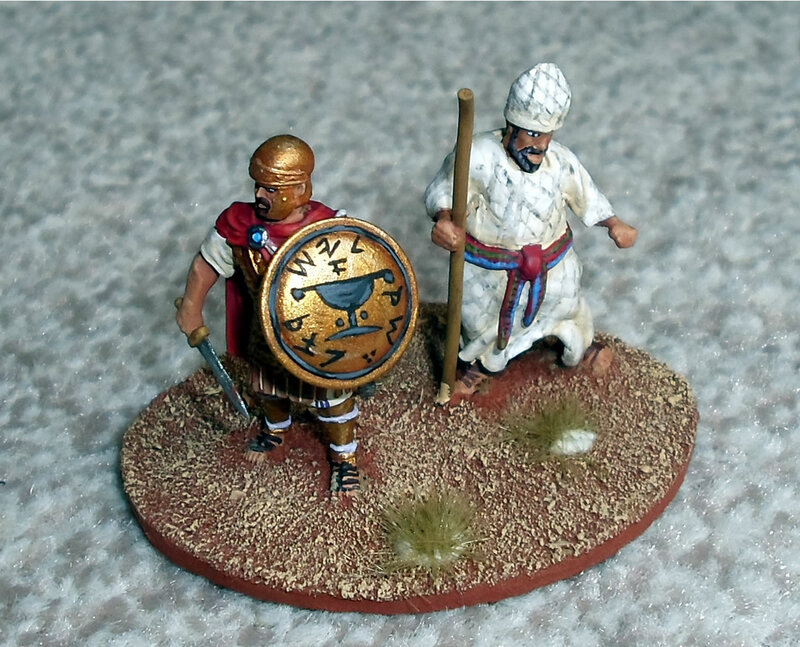 Whilst into it, I decided to produce a General, based on the Carthaginian Infantry commander in the Victrix set, he looks the part. Johnathan, and a chubby priest! I'm not so convinced by his portly pal. I wanted to do a Jewish Priest, but I certainly hit my sculpting limits here trying to put robes over a Numidian torso. The finished figure is disappointing, but he'll have to do. The Perry's can rest easy. At last this is something like a battle array, with three units of heavy infantry, and two light, plus a commander. 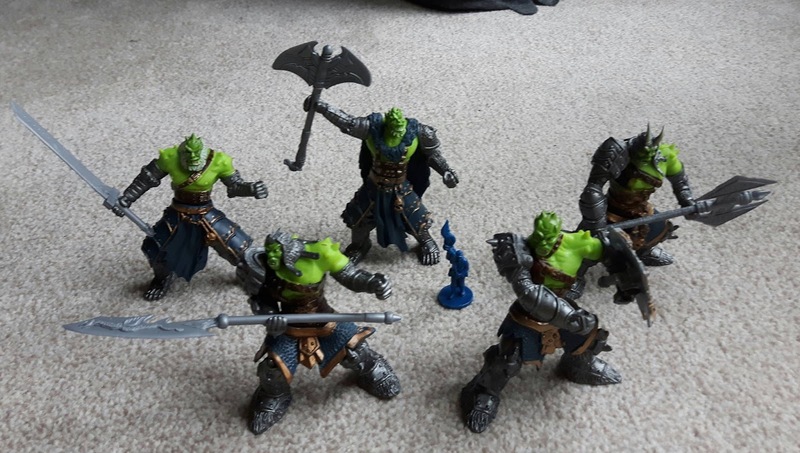 Not a full army by any means, but progress is being made. And a colourful force they are too! Something I really like. But now I must decide what to add next, and then do some more sculpting. I think there is enough heavy infantry for now, bowmen and slingers seem to me to be the next choice. I do not know if the following will ever find a purpose. They were something of a whim. 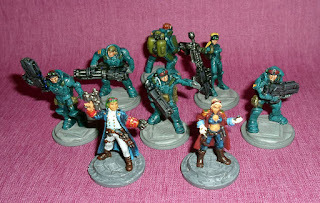 One of the very first things I painted three years ago after my hiatus from the hobby, was a batch of Reaper future police from my Bones Kickstarter; a set of models I felt would be good to practice on and were of no particular use to me. They ended up sold on eBay for a pittance. 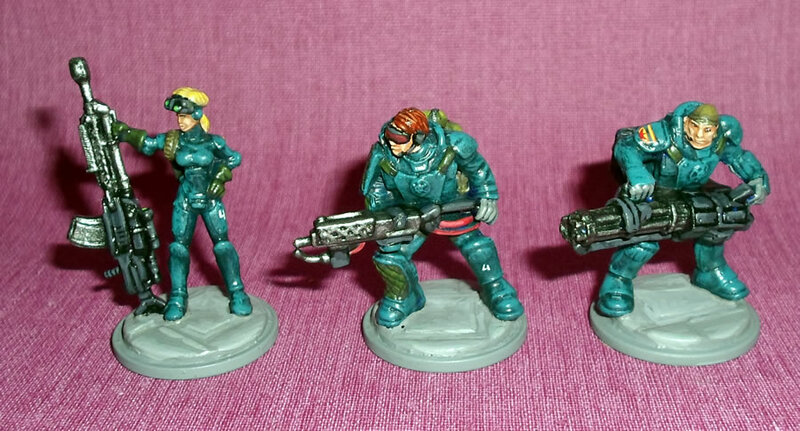 Now I've dipped into the same unending box of toys to paint a handful of new models, with at least a notion they could serve in some of the small scale Sci-fi miniatures games Osprey, among others, seem to have been churning out of late. 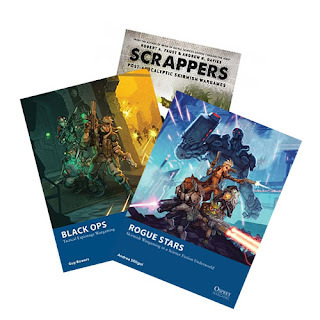 My general view on Sci-fi warfare remains unchanged; I hope to goodness that in due course it will become an artefact of history, at the very least, technology will surely bring conventional warfare to an end, as the technology becomes terrifyingly autonomous and ever more potent. 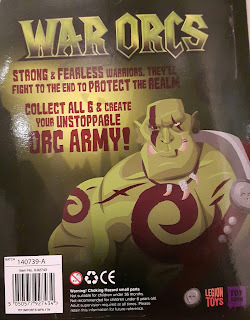 Not much of a game really, and one I'd hope wouldn't exist by then*! However at the human scale of handfuls of individuals, the position may well be different, with the same old lusts for wealth, power and revenge. Whether 20 minutes into the future, 20 years or 200; these elements may remain unchanged, and perhaps excuse a game. 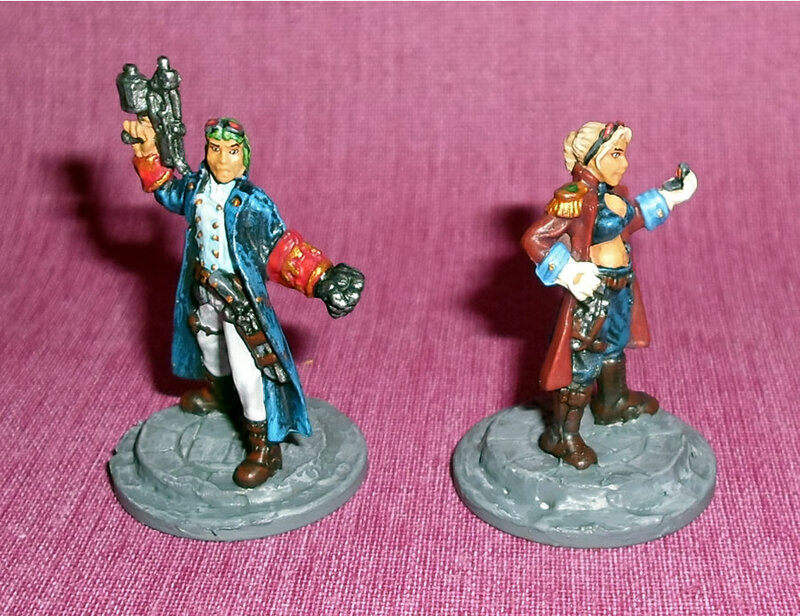 I think these may have been meant as Steampunk or modern fantasy models, but I think they painted up suitably together. Straight out of a futuristic buddy movie. Only quickie paint jobs, and as a result the male figure looks a little chalky under the flash; but not bad for the limited time invested. 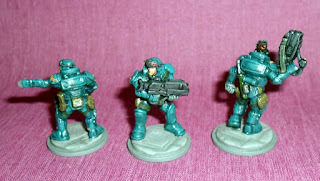 These were done in a bluish green base, a slight variation on one of my favourite colour schemes. 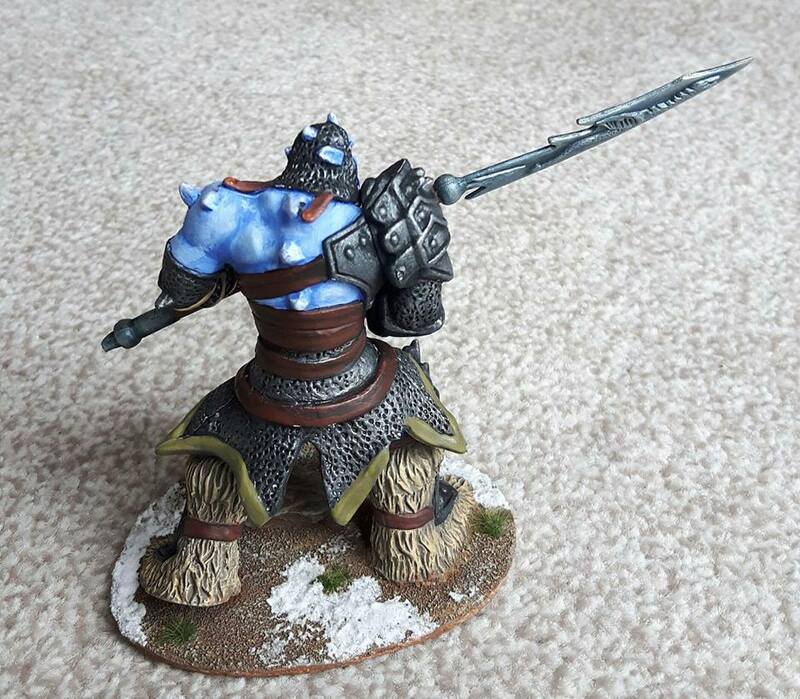 The beauty of these was that a good 90% of the model could be done with this scheme; this being furthered by multiple layered highlights simply over-brushed on, and augmented with contrasts and small details. If anything I like the security squad the most. *Of course Star Wars does not count as it clearly happened a long time ago in a galaxy far far away.